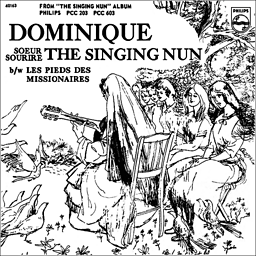 Jeanne-Paule Marie "Jeannine" Deckers (17 October 1933 – 29 March 1985), better known as Sœur Sourire ("Sister Smile", often credited as The Singing Nun in English-speaking countries), was a Belgian singer-songwriter and for seven years a member of the Dominican Order in Belgium as Sister Luc-Gabrielle. She acquired widespread fame in 1963 with the release of the Belgian French song "Dominique", which topped the US Billboard Hot 100 and other charts. "A Gladitorial Element": Guy Garvey on singers and stand-ups.